The government has a school system in place in Alirajpur district but it is woefully inappropriate. The syllabi and teaching methods of the education system are totally alien to the culture of the Bhils. There is insufficient staff in these schools, which are mostly multi-grade single teacher schools. The teachers prefer to stay in the towns and market villages and only visit the schools occasionally. Very few Bhil children get educated as a result of this mismatch. Those that do treat their own culture as something primitive and sub-human in accordance with the prevailing modernist assumptions and distance themselves from it and their own community. This has resulted in the vast majority of Bhils remaining unequipped to participate effectively in the modern economy into which state policies have been relentlessly pushing them. This lack of a modern education has also meant that the awareness of their rights and enabling laws has been low among the adivasis. The Khedut Mazdoor Chetna Sangath first began experimenting with alternative schooling as early as 1987 and developed texts in Bhili and Bhilali for teaching literacy and numeracy and also local geography and history. Later on it was felt that children needed more attention than was possible in a day school and so a decision was taken to start a residential school. A review of the functioning of the day schools had shown that effective teaching of adivasi children of illiterate parents required that they be drilled even after regular schooling hours. Since this was not possible with day scholars it was decided to run a residential school.One such school, Rani Kajal Jeevan Shala, has been set up in the village Kakrana on the banks of the Narmada River. The school has been named after a Bhil Goddess Rani Kajal who in their mythology rescued them from trouble in a time of pestilence. Thus, the name symbolises the main aim of the school, which is to revive the traditional culture of the Bhils and establish a strong identity for them. Secondly it was decided, as far as possible, to make the parents pay in cash and kind for the education of their children so as to try and make the day to day running of the school financially self-sustaining. This, in turn, meant that the school would have to make the children proficient enough to perform well in the mainstream school system to accord with the expectations of the parents most of whom would naturally be paying for an education that could get their children jobs later on. Thus, the syllabus and teaching would have to take care of both the needs of inculcating a critical attitude towards modern development in the children as well as providing them with the skills to make it good in the modern sector. Obviously, this is a tall order and requires a lot of hard and committed innovative work on the part of the teachers. So funds have to be collected from various external sources, both institutional and individual for the costs of curriculum development, teaching aids and part of the salaries of the teachers. 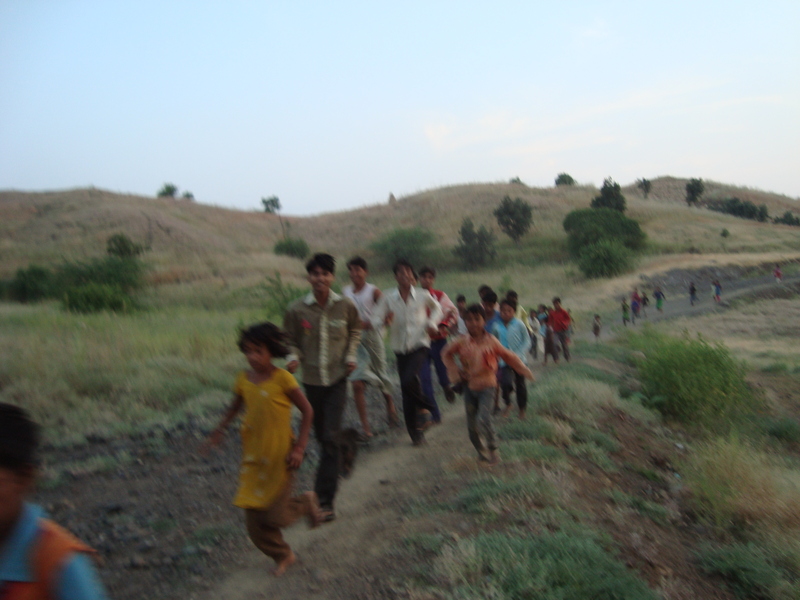 The picture below shows the students of the school out on an early morning run. The school started from scratch without textbooks and the language used was Bhilali a dialect of Bhili. The conducting of surveys and writing down of the rich oral literature of the Bhili creation myths was used to acquaint the children with the basics of language and arithmetic and in the process create primers. One such survey, which was both entertaining and educative, was conducted to find out how, if at all, the teachers were teaching in the government schools and then comparing the results with the procedures being followed in the Rani Kajal School. The local environment provided the material for scientific learning through observation and analysis and local history as related by the elders was recorded to prepare the history lessons. Later only as the children become proficient in studying are the standard Hindi texts, conforming to the syllabus of the Board of Education, introduced. In addition to their studies the children have to put in two hours of labour everyday on the three-acre farm of the school so as to ensure that they do not lose touch with their peasant farmer roots. Possibly for the first time academic learning has become fun for Bhil children in a systematically run school environment. The students of the school have consistently topped from Sondwa Block in the board examinations. The biggest compliment to the school is that adivasi parents who migrate seasonally for labouring have put their children in this school totally under the guardianship of its teachers while they spend their time in distant work places in Gujarat. For the first time girls from the villages on the banks of the Narmada have got education and one of them has even become a teacher. The great thing is that the school has three adivasi lady teachers, pictured below who have given up the lure of the towns to come and live and teach in this remote village. One of them is physically challenged as is one of the men teachers also. Education for tribals is a mission and it is only possible for missionaries to deliver. Secular tribal missionaries in this case!